It may seem a small feature, but the fact that the Sony Cyber-shot DSC-RX10 uses Micro USB, or ‘multi-terminal’ as Sony calls it, is a bonus. Micro USB connection leads are used to charge almost all mobile phones these days, except the Apple iPhone, and the cables are readily available. 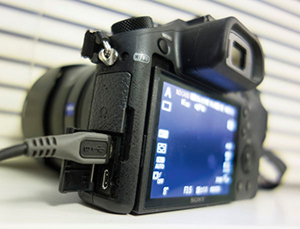 Therefore, the RX10 can be charged via any powered USB socket, be that a mains USB charger, a computer or, more usefully for photographers, a back-up battery. I keep cameras charging in my car via the USB port in the stereo while driving out to shoot. A back-up USB battery can be used to charge both your phone and camera, so I often carry one of these around for my compact instead of a spare battery. Basically, this means there is little excuse for not being able to charge your camera’s battery, which is a huge advantage if you do a lot of travelling. A number of manufacturers have compacts and compact system cameras that charge via Micro USB connections, and it is definitely worth keep an eye out for this feature as it can be a real lifesaver.